On Miralem Pjanic, the new Pirlo? After Juventus’ qualification against Tottenham, all eyes were on Gonzalo Higuain who finished the two games with three goals and one assist. Though these two huge performances from the Argentinian, who on the way silenced his detractors who said he was not decisive in the big games, there are a lot of things to say about Juventus, not only in these two games. With Napoli as their main competitor, Juventus is still at the top thanks to being brilliantly led by Allegri who also has good transfer management. Here we are going to talk about Miralem Pjanic, probably one of the most underrated midfielders at this level and maybe the one that has evolved the most. At 27 years old, Miralem Pjanic still has room for progress. Unlike other players at this level, Pjanic has evolved in an increasing way. From Metz to Lyon to AS Roma and now Juventus, he went through all the stages to perfect his skills. What is interesting in Miralem Pjanic evolution is how he moved in different positions of the midfield. In Lyon, he was aligned more as an offensive midfielder. When Juninho went left Lyon in May 2009, Claude Puel chose him to replace the Brazilian after a season full of injuries. Alongside Toulalan and Makoun, two defensive midfielders, he was in the starting eleven 27 times in Ligue 1. He delivered 11 goals, 13 assists in all competitions in that season with top-class performances especially against Real Madrid in Champions League (eliminated by Lyon in quarterfinals). A year after, “Miré” chose to go to AS Roma after his progression was blocked by the arrival of Yoann Gourcuff and Clement Grenier, two promising French talents who would eventually to prove their talent mainly because of long-term injuries. Within Luis Enrique’s squad, Pjanic was utilised in a variety of positions, taking on left, central and right-sided roles, even being deployed as a forward on several occasions. But, it must be said, Miralem made his mark as a central midfielder – exactly what sort of central midfielder varied with Enrique’s chosen tactics of the day, somewhat modified version of tiki-taka. With Massimiliano Allegri, he also plays in different position, but the trend goes to a more defensive role. This evolution is not very easy to understand with a midfield composed by Sami Khedira, Blaise Matuidi, Stefano Sturaro or Claudio Marchisio, possibilities in the heart of the midfield are quite limited with a lot of defensive profiles (Asamoah is used in a different role). The graphics below show how Miralem Pjanic is generally positioned in the midfield. As we can see Pjanic plays most of the time as the more defensive player ahead of the defence. This is where there are similarities with Andrea Pirlo. With his passes, vision or vista qualities he is the perfect deep-lying playmaker, like the Italian legend some years ago. What is surprising here is how he is surrounded: alongside Matuidi and Khedira (most of the time) he is basically the most offensive player of the trio. Nevertheless, this is not shaming Allegri who has a fine sense of tactics, like we have seen in Champions League against Tottenham. In fact, Matuidi is not as much a defensive midfielder. Like when he was in PSG, the Frenchman is very offensive when his team has possession of the ball and thanks to his stamina he can come back quickly in defence. Khedira has a more classical profile and he is maybe the “sentinel” of the team, a player that has huge control of his game with and without the ball with a high game volume. Moreover, the German often serves as a pivot to Pjanic who can go ahead easily while he has also good skills qualities, something we often forget. Alongside these two experienced players, Miralem Pjanic has all liberty to develop his own game with a mix of long ball breakthrough and very efficient off-ball movement. With a more offensive past he’s not restricted to staying behind and he has a lot of influence on the way his teammates play in offensive phases. The graph below shows the average ball touch locations from the Bosnian which show how he is influential all over the pitch. 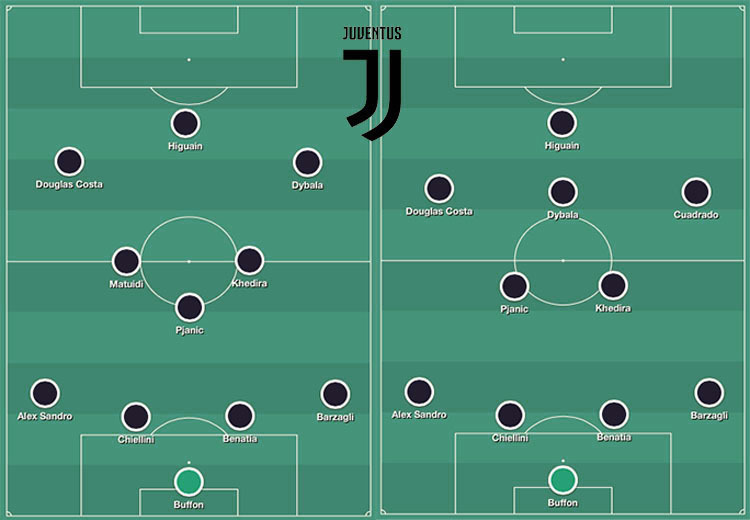 Therefore, Allegri probably finds the best formula with a very balanced midfield that shines both in defence and in the attack, what is felt in the general game of Juventus. 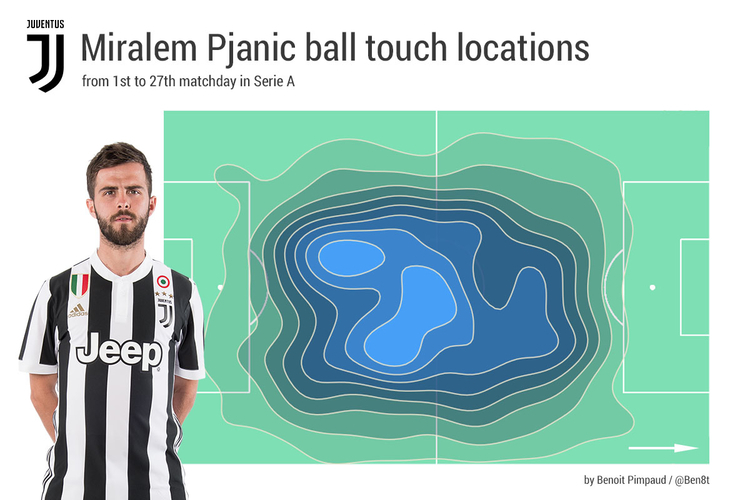 While the comparison with Pirlo is easy (and we don’t talk about free kicks here), Miralem Pjanic still has some progress to make to reach the same level as the Italian. He can still improve his “passing rate” which is maybe a bit fast and so with too wasteful at the moment. Moreover, he is still too discrete when his team doesn’t govern the game and he doesn’t have yet the legitimacy to have the “leader” role (especially with Buffon and Chiellini in the team) through a certain spirit in that way. Beyond this, there are some rumours that say he will go to FC Barcelona, something that could be a good idea. He already played under Enrique and he fits perfectly with Barcelona style of play. Though he plays a bit like Busquets this year, it could be interesting to see a Busquets – Pjanic association with the Bosnian a bit more offensive, like he was in Roma or Lyon.